Political direction can be scientifically and mathematically quantified. The Left is rooted in fantasy and Hollywood type imagination, based upon wishes more or less of how they would like things to be and how they would like to get there. Unfortunately their logic is not founded upon good evidence and realistic goals achievement methods, as such it is not productive or efficient and not firmly rooted in factual methodology. Reality can be ugly, even painful, but it is still reality and thus quantifiable and the only basis for good government. We have a major division in this country, and truthfully it exists in many countries as a global phenomenon. The hard work is to intelligently determine the difference between the dreams and imagination of that found on the left side of the political spectrum, and the less entertaining and less appealing but more factual and productive understanding of processes found on the right. People want to believe in dreams, but if those dreams lack the foundation of reality they doom us all. Political actions impact all citizens and faulty actions have faulty consequences that end up impacting our basic rights by unbalancing the costs versus the reward, ending up doing bad to us instead of good for us. Let us understand that government is the natural enemy of the people. Read history, state control is and has been the single largest and most common oppressor of people in history. Both Russia and China reportedly killed what some report to be as many as 70 million of their own people in the last 100 years. Not to mention the numbers of both Germans and others killed by Fascists and the totalitarian Japanese during World War Two. The end game of Leftist “big government” can be thought of as life in the feudal Dark Ages where there were those few in charge of the governing system with the majority little more than serfs who operated within the strict rules of those who governed and provided the production of goods which were taxed at 50% or more for the benefit of those who made the rules. These are all examples of big government and populace controlling political platforms, with the big government component of them, by definition, placing them solidly on the left side of the political spectrum. Knowing this frightening fact calls us to limit the size, scope, and power of the state as a parenting agency and keep them on a very short leash if any degree of historical perspective is used. In order to accomplish the level of understanding required to properly categorize political philosophies the inaccurate propaganda and generations of Leftist indoctrination must first be ignored. The goal of a freedom loving people is to form a central national defense to defend against undue aggression of others and beyond that restrict what the state can take from us and do to us. This is difficult to accomplish. One of the most difficult parts of the process is to maintain a system where public officials and politicians are sincere employees of the people instead of as perceived royalty. Large government negatively impacts the economy. While they continue to control more and more of your life and your income, their inefficient and non-productive involvement in the economy contributes a braking effect on the overall economic engine. Operations within the bureaucratic jungle is also rife with WASTE and CORRUPTION. These are characteristics of government that cannot be avoided and are nearly impossible to minimize. It is common for three or four employees of a government entity to do the work that a single person engaged in private enterprise accomplishes. There are two reasons for this. The first is lack of motivation. A government job insulates one from the fear of failure and offers less in potential reward, resulting in higher overhead costs and less productivity. A second contributing factor is the knowledge that government breeds corruption and as stewards of the public trust they often add multiple levels of checks and balances which may be costly but are unavoidable, so limiting government is again the solution. Since power is shifted from the people to the government in all areas where it is given jurisdiction, the goal should be to minimize government in order to minimize the adverse effects of the inherent waste and corruption they produce. Individually and in sum these reasons lead to the conclusion that the best government is the smallest, that the people must always work toward paring it down, and they must be suspicious of any suggestions to the contrary because there must be an alternate agenda behind the words. The goals of a national government, if a strong economy and freedom are the agreed upon goals, is to limit government and the hundreds of thousands of laws and the myriad of regulatory agencies that weigh down the people and the economy. After determining that personal safety and freedom, which protect the physical person combined with economic strength for society as a whole are the best political priorities, it is then determined that political decisions must based upon the prioritized goals of national defense (government), productivity (people), and efficiency (both government and people) in all areas under their control. In this way everyone benefits and maximizes their success and their freedom when government operates under these three precepts. 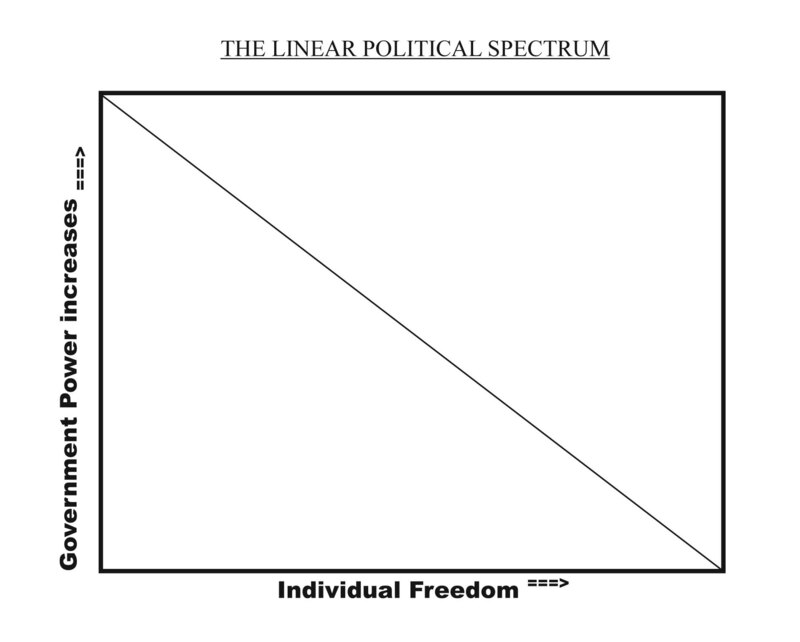 At this point we introduce the Linear Political Spectrum which is the single most important tool for people to understand the various political positions and their effect upon our stated goals. For now understand that the upper-left corner is NOT where a governed people want to be as it hinders both freedom and the economic engine, meaning that the best balance is somewhere down near the bottom-right on the graph. Understanding the relationships plotted here between these two competing forces is key for voters in order for them to make informed and consistent political choices. Efficiency is the way to determine the value of how goals are accomplished, and less government involvement is always more efficient. Remember that the government produces nothing, so the judgment call is just how much are you willing to let them take out of the economy? Often that is the difference between a productive or unproductive economy. Government involvement is certainly a drag on the economy, limiting its growth unnecessarily in most cases unless there is immanent danger and the short term risk is worth it when balanced against the inherent losses. When a situation like this does occur and a temporary shift toward more government involvement is deemed necessary such as during wartime or other crisis, we must be sure to limit the duration of all increased government programs so that they revert to a better position once the danger is past. Government reverting back to a better balance is not common and not an easy task, historically it has been accomplished with revolution that sweeps away the burdensome layers that have been cast into place. Be suspicious of the government always. They are never your friend, but a necessary and costly administrative layer that often attracts power-seeking individuals and those that lack the ability or strength to work in the private sector. It is about control at all levels. Be suspicious of those who want more government, that is a sure sign that they are not doing it for the good of the governed. Please continue reading our Mis-Leading America series as we provide in-depth written and visual analysis of the major political parties and where their policies lead. Details will be provided along a historical timeline in order to build your understanding.